My essay entitled “‘There Is an Abundance of Those Which Are Genuine’: Northern Travelers and Souvenirs of the Antebellum South” appears in this delightfully engaging and often funny collection of scholarship about the marketing of the South to outsiders. Other topics include Krispy Kreme donuts, the Horny Hillbilly, and that crumbling mecca of schlock known as South of the Border. Check it out by clicking the image above! You can order your copy right now at Amazon for a mere $24.95. Drawing on nearly 450 individual published and unpublished travel accounts of the antebellum South, Strangers in a Strange Land examines the vital role that northern travelers played in constructing, amplifying, and disseminating a national narrative of southern difference in the years leading up to the American Civil War. As early as 1815, northerners had already embraced a host of core stereotypes and assumptions about southern identity, seeing the South, its people, and its culture as fundamentally distinct from and inferior to the North. Such views were based largely on their reading of early travel narratives of the South, many of them written by foreign visitors and published by the northern commercial press. In the years after 1815, however, more and more northerners began to record their own impressions of the South, using the published accounts they took with them—as well as the conventional assumptions about southerners embedded therein—as a template for constructing their own narratives about southern identity and difference. These new travel narratives of the South, whether written for publication or merely shared with friends and family as private documents, contributed to the increasingly influential perception that the North and South were so fundamentally distinct from one another that they were as two foreign and opposed nations and peoples residing within the borders of a single country. And while slavery was not originally the sole factor—or even the most important one—at the core of these assumptions about sectional difference, by 1845 the South’s peculiar institution had become inseparable from this recurring northern narrative about all that was backwards, antiquated, uncivilized, and morally reprehensible in southern life. Strangers in a Strange Land traces these shifts in the narrative, recounting how northern travelers updated that narrative by weaving the political questions of their day with their long-held and largely unchanged stereotypes and assumptions about southern identity. After exploring the construction of this national narrative through the northern commercial press and enumerating the stereotypes that were most commonly used to define and describe the South and its people, Strangers in a Strange Land examines the northern traveler’s experiences as a vehicle for sustaining this narrative of southern difference. In particular, the project analyzes the ways in which these travelers used their sensory impressions of the South (haptic, gustatory, and olfactory, as well as auditory and visual), their confusion about southern temporal sensibilities, and their interaction with southern material culture (and souvenirship in particular) to verify and document their assumptions about southern difference. Strangers in a Strange Land is written for use as a supplementary monograph in undergraduate and graduate history and American studies courses on nineteenth-century America, American popular culture, the antebellum South, American national and sectional identity, and the coming of the Civil War, as well as for scholars and mainstream readers with an interest in these topics. It serves as a useful counterpoint and complement to such recent works as Susan-Mary Grant’s North Over South, Jonathan Daniel Wells’s The Origins of the Southern Middle Class, 1800-1861, Peter Charles Hoffer’s Sensory Worlds in Early America, John D. Cox’s Traveling South, and Mark M. Smith’s Mastered by the Clock. The manuscript runs 415 pages, inclusive of notes and bibliography. “‘Let the Constitution Perish’: Prigg v. Pennsylvania, Joseph Story, and the Flawed Doctrine of Historical Necessity,” Slavery and Abolition 25:3 (2004): 76-101. In 1842, US Supreme Court Justice Joseph Story wrote and issued the majority opinion in the case of Prigg v. Pennsylvania, a landmark decision in which the court upheld fugitive slave recaption as an historically necessary constitutional provision that had to be protected at all costs. The decision proved to be a powder keg for William Lloyd Garrison and other abolitionists, but it also transformed and complicated the national debate about slavery. This article examines the flawed sense of constitutional history on which Story based his opinion, under which the fugitive slave clause was presumed to have been the result of a “bargain” struck along sectional lines in 1787. The term “historical necessity”–which was never used before 1800 to describe the constitutional negotiations over fugitive slaves–instead appears to have originated in the state-level decisions of a relatively obscure Pennsylvania justice named William Tilghman, the very cases on which Story based the rationale for Prigg. 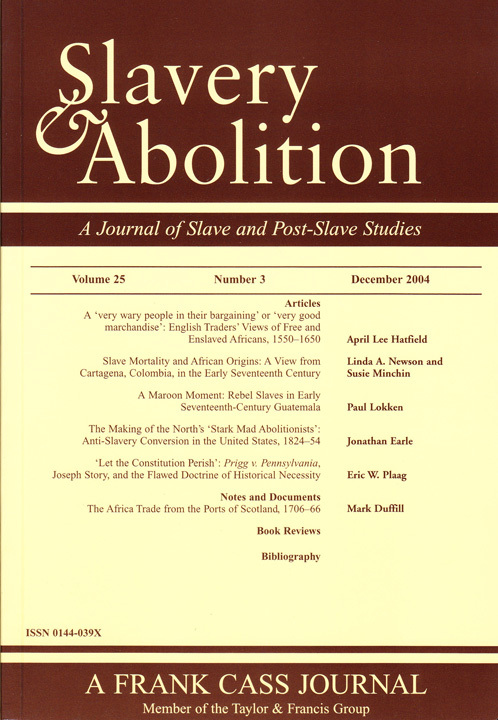 In spite of objections raised by numerous national figures in the wake of Prigg, the “historical necessity” justification, as codified by Story, continued to be used by others as an explanation for the national firestorm over the rights of slaveowners. 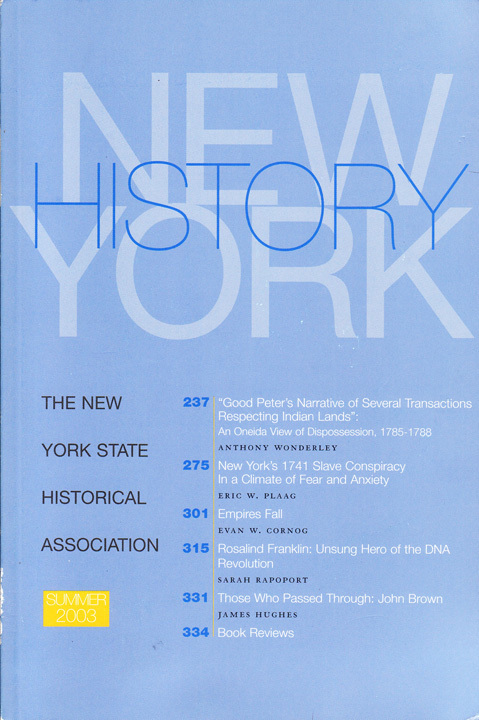 “New York’s 1741 Slave Conspiracy in a Climate of Fear and Anxiety,” New York History 84:3 (2003): 275-99. While much has been written about the 1741 New York Slave Conspiracy, very little attention has been paid to the pressures on New Yorkers in the years preceding 1741 that compelled them to accept rumors of conspiracy so willingly. In particular, many of the participants in the 1741 investigation had themselves participated–or had direct familial links to those who had–in the investigation of the 1712 New York Slave Insurrection, in which conspirators had followed a script for rebellion with many similarities to that purportedly uncovered in 1741. This article identifies and explores the links between those two events.